I scored tickets to an advanced screening of Edge of Darkness last night and I quite enjoyed it. I disagree with that review that I posted earlier from Variety (here). But then again, I'm not a movie critic. As long as the movie is fairly entertaining, I usually enjoy it. My favorite part was just the sheer amount of "Boston" that you get to see in the movie because a lot of it is either spent walking around outside or driving around in the Boston vicinity. Great shots of Boston Harbor, South Station, The Public Garden .... and it goes on and on. Over the last few months I've watched several of our beloved Made-In-Boston movies: The Surrogates, Bride Wars, The Proposal, Boondock Saints (yes, I just now saw it). Out of all of them, I think Edge of Darkness is probably in 2nd place. The Departed gets first place. And I can't bring myself to watch Ghosts of Girlfriends Past, so until Shutter Island or Grown ups comes out. Edge of Darkness is going to be up there on my list of fave Boston movies. Oh and PS. 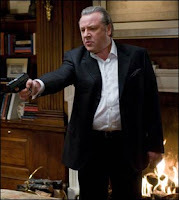 Robert De Niro is a great actor, but Ray Winstone did a pretty great job in the movie. I don't want to say I'm glad De Niro quit, Winstone did a good job with the character (here). Click (here) for other EoD posts. 0 Response to "Go Watch Edge of Darkness"